If you are looking for advice and help on hosting a tea party for 20 people, or just yourself, look no further! Do you want to share the serenity and pleasure of breathing in the heady citrus aroma swirling around you from a warm cup of Earl Grey tea ... or the first sweet bite of a orange and cranberry scone? What? 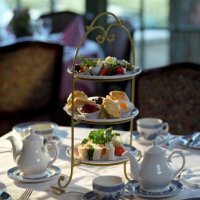 You don't live near a large metropolitan area with a plethora of tea rooms and gift shops? Or maybe you do, but you feel too intimidated by the fancy, formal atmosphere to venture in and ask for help? Don't be left outside, denying yourself the joy of taking tea! I've solved that problem by bring a virtual tea emporium to you! Welcome to Cozy Cottage Tea Company! Please come in, find a comfortable chair, and I'll put a kettle of water on to boil. Then we can sit and talk, over a wonderful cup of tea! Just you and me. Nothing too pretentious, no pressure ... just cozy, warm and relaxing. Like two old friends. Wondering where the best place is to buy your tea (loose leaf or in tea bags) and how to prepare a wonderful pot of tea every time? These are all important parts of hosting a tea party. I'll show you the tips and tricks. where to buy, or how to make, charming Tea Gift Baskets for yourself or a friend! Want to know where you can pick up a large set of tea cups wholesale for the next time you're hosting a tea party? Don't have time to scour the flea markets and antique shops all over town, no matter how fun it might be? Maybe you are a recovering collector of tea pots and tea cups, like me? Never met a teacup or teapot you could say "no" to? Once an addict, always an addict! Well you don't have to keep your "dirty little secret" to your self any longer. Tea cup and Tea pot lovers unite! I'm going to show you where to buy all your tea paraphernalia from the cheap to the sublime. So ... do you take your tea with 2 lumps of sugar, or just one? Honey? Cream? or Lemon? Either way, relax, you've come to the right place to find the answers to all your questions about Tea ... sit back and Enjoy! There are 4 types of tea: Black, Green, Oolong and White ... the rarest! White tea benefits are found to be better than even green tea! Choosing Tea Cups To Compliment Your Tea Party! Where to find tea cups wholesale for your next tea party. Which is better plastic or paper tea cups? Tea party ideas for hosting the perfect tea party. Need help with invitations, decorating and party favors? You've come to the right place. Tea Party Invitations: suggestions and ideas. Tea Party Table Settings-how to decorate a beautiful tea table. Try serving delicious Southern Tea Cakes and Russian Tea Cakes at your next tea party. We've included some easy and quick recipes for you. Southern and Russian Tea Cakes Recipe is easy and delicious. If you have questions about tea, hosting a tea party or tea party ideas, ask them here and we'll try to answer. © Copyright 2009-2017 Cozy-Cottage-Tea.com All rights reserved. No reproduction permitted without written permission.